A typical Irish touring coach. It isn’t possible to exaggerate the diversity of the Republic of Ireland. Dublin, one of Europe’s most popular vacation destinations, is a bustling multicultural capital boasting one of the world’s most dynamic and profitable finance sectors. If you are looking for guided tours in Ireland, then you will pleased to know that there are a plethora of coach operators offering a diverse range of themed tours. As well as its famed museums, galleries and theatres, the Irish capital offers superb shopping, an effervescent night-time entertainment scene and some genuinely formidable dining. Away from the major towns and cities, however, there are some of the planet’s most beautiful natural landscapes, which include everything from lush green hills to isolated mountains to rugged, windswept coastlines. And then there’s the joy of meeting the Irish in these widely diverse settings. There are several excellent ways of touring Ireland, but coach tours often represent the most comfortable, convenient and cost-effective mode of exploring as many of Eire’s delights as possible. In this guide, we set out the main considerations to take when you are choosing from the many accredited operators, as well as the advantages and disadvantages of coach tours. Perhaps the most important exercise you can undertake to ensure you enjoy your coach vacation is to spend time exploring in depth what you and any travel companions are hoping for from the trip. Are there any venues, for example, that you simply insist on visiting? Would you like to incorporate some specialist activity into the tour, such as trying out Michelin-starred restaurants? Is there a region that is especially dear to you- perhaps for family reasons? Do you want generally to experience the heritage and culture of the country? Are you contemplating incorporating another country, such as Wales or Scotland, in your travel itinerary? Time spent reading one of the excellent guidebooks to Ireland and deciding your priorities will be amply rewarded when the time comes to embark on your tour. Having established your geographical criteria, the next step is to decide on budget. Tours vary dramatically in price, depending on the type of accommodation and food on offer and the amount of time spent in more expensive locations such as Dublin or Cork. It’s fair to say that spending more does not necessarily guarantee a more enjoyable trip but, in general terms, lower-cost tours will usually involve staying in clean, comfortable hotels or possibly hostels or bed-and-breakfasts, which perhaps lack some amenities, while the more expensive offerings are likely to include overnight stays at five-star luxury hotels. People’s requirements in this regard vary widely: some are happy with relatively basic accommodation as long as they see the sights, while others enjoy a little luxury or indulgence. On a related note, some of the specialist tours may be a little costlier if they include visits to top-class golf courses or the finest gourmet restaurants. Again, this is a matter for the individual traveller and his or her companions, but it is worth remembering that there are tours available which cost several hundred euros, while others may cost thousands. Having made these decisions, the tourist can now begin exploring the options available. As an example, you may have decided that visits to Dublin, Galway, Donegal and Belfast are your main stipulations, along with high-quality accommodation and that your budget is in the order of three or so thousand euros. You are, in all probability, going to find that there are several companies offering suitable packages. Choosing between them can be difficult, but online testimonials are now widely available and are an extremely useful guide since internet reviewers are notoriously and unflinchingly honest about their experiences. It is also quite a simple matter nowadays to check a company’s financial situation to ensure that you are paying money to stable businesses which have the resources to offer everything they claim to offer and which will be able to refund you or compensate you if anything goes wrong. On a similar note, you might want to check that the company has adequate insurance. Membership of various travel associations such as the Irish Tour Operators Association (ITOA) can be a useful indicator of a company’s status, although it doesn’t guarantee an enjoyable vacation. 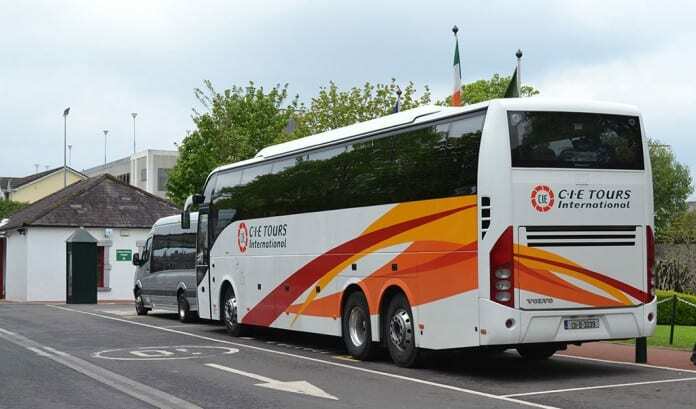 Accredited operators providing services for touring Ireland will, however, usually have experience and expertise and the required financial strength to give you peace of mind about the safety and comfort of their coach tours. Coach tours are among the most enjoyable means of experiencing a country, and nowhere is this more true than for touring Ireland. As well as seeing Eire’s manifold delights, you will meet people from around the world as well as the wonderfully engaging locals. Accredited operators can help deliver the holiday of a lifetime in the Emerald Isle. We look forward to welcoming you soon: “failtionn mile”, as we say to new friends. The principle advantage of touring Ireland by coach is that it enables you to sit back and relax during your entire vacation. You can enjoy the scenery and attractions without the stress of driving on unfamiliar roads or having to stick to public transport schedules. Likewise, the price of coach tours tends to include accommodation, entry to landmarks and even some meals, which as well as helping you to plan and contain the cost of your trip is convenient and strips away some of the annoying administration which can accompany travelling in any country. Accredited operators of tours employ only the most experienced drivers and use modern, comfortable and safe coaches which are fully insured, meaning that you can be assured of a pleasant and safe journey. These practical considerations aside, however, one of the most agreeable aspects of touring the Republic of Ireland by coach is the congeniality of the experience. You may have several travel companions to help you enjoy your vacation, but you will also meet new acquaintances from across the globe. Reading a review page, it is entirely possible that you will note comments from visitors from North America, Great Britain, Australia and New Zealand and many other countries. Meeting people from cultures other than your own is always one of the most enriching features of travel, and it is guaranteed if you choose to tour by coach. These diverse gatherings highlight the appeal of Ireland as a travel destination and also its astonishing cultural reach. Of course, there are millions of people across the world who are very proud of their Irish ancestry, and they often have an intense desire to see the land of their forefathers – a coach trip of the island is, in many ways, the best way of accomplishing this ambition. There is certain be a tour available which will accommodate all of your vacation aspirations. For example, if you want to see the treasures of the west coast, there are many operators offering excellent tours of this region. Similarly, there are numerous themed tours catering to special interests such as food, history, golf or even the slightly whimsical “pubs and folklore” Ireland tours. These latter trips allow you not only to see Ireland’s outstanding natural beauty and its centres of culture, but also to see showcased its other attributes such as world-class gourmet restaurants, glorious churches and symbols of the country’s heritage, such as the famous Celtic high crosses. Finally in this section, most of these types of tour will include the services of expert guides whose knowledge of Ireland is unparalleled and who will make sure you miss none of the landmarks en route. Quite often they will have fascinating or entertaining anecdotes about sites which don’t necessarily appear in the travel guides, thereby offering you a unique insight into the country. The professional guided tours in Ireland will also be delighted to answer any questions and address any concerns you may have. Like everything, coach travel has some issues, and these may deter some visitors from ultimately choosing this option. Touring by coach tends to be a sedate affair, geared to those who want to see Ireland at a leisurely, relaxed pace. This is certainly not to everyone’s taste. Equally, if time is at an absolute premium, coach travel is seldom the quickest way of getting from A to B. This can frustrate some travellers. Coach operators will also have taken great care to create an itinerary to suit as many people as possible. Once a route and schedule of stops and accommodations have been developed, they are only subject to change in the most extreme circumstances, meaning that there is little scope for spontaneity. If you decide you would like to remain at an attraction longer or even avoid one, you may be disappointed with the lack of flexibility. If you prefer to set your own schedule, an independent travel option may be the better choice for you. While many tourists enjoy the camaraderie and companionship offered by coach travel and find the new friendships to be among the most memorable aspects of their vacations, some people prefer their solitude and to experience a country without the distraction of others. Most coach journeys will provide windows of opportunity for quiet contemplation, but these tours are essentially sociable enterprises. You will need to consider whether you would be comfortable and content in this sort of environment and make your decision accordingly. The most common remaining disadvantage cited by reviewers is the limited luggage you are permitted to carry with you on a coach. This appears to be less a problem as regards clothing that you are able to pack than for shopping, souvenirs and memorabilia you may wish to purchase while on vacation. Clearly, the importance of this varies from individual to individual, but it is probably worth deciding whether you are happy to travel with only limited luggage.